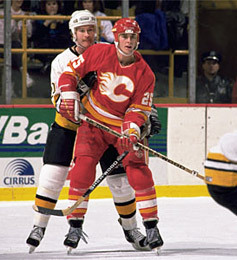 Nieuwendyk began his career with the Calgary Flames, winning the Calder Trophy in 1988. Born in Oshawa, Ontario on September 10, 1966, and then raised in neighbouring Whitby, Joe Nieuwendyk played college hockey at Cornell University in New York State. A cousin of NHLer Jeff Beukeboom, Joe spent three years on the Ivy League school's team and was twice named to the ECAC's First All-Star Team (1986 and 1987). He was also selected as an All-American in both years. Besides being an exceptional hockey player, Nieuwendyk was also considered to be the best lacrosse player in Canada, and at one point he even played on a team that won the Minto Cup, the country's top award in that sport. 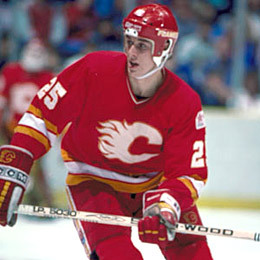 In 1985, after his freshman year at Cornell, the Calgary Flames were sufficiently impressed to draft him in the second round, 27th overall. In his first full season as a Flame (1987-88), the young centre scored 51 goals and 92 points, becoming only the second NHL player after Mike Bossy to score 50 goals in his rookie season. His totals also included an eye-popping 31 powerplay goals and 8 game-winners, and he was rewarded with the Calder Trophy as the league's top rookie. 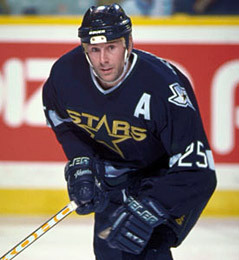 Nieuwendyk won his second Stanley Cup with Dallas in 1999. Nieuwendyk's second season with the Flames was just as impressive as his first. He was the leader of a team that won the Stanley Cup, again scoring 51 goals. In 1991, he was named captain of the Flames. When knee problems prevented Nieuwendyk from playing early in the 1995-96 season, the Flames found few takers on the trade market. Finally, in December 1995, the Flames traded Nieuwendyk to the Dallas Stars for Jarome Iginla and Corey Millen. Known as an aggressive player in front of the net as well as an exceptional passer, Nieuwendyk's style of play caused him a number of health problems. He missed most of the 1998 playoff due to a knee injury. However, in 1999, his health and luck returned as Nieuwendyk scored 6 game-winning goals in the playoffs to lead the Stars to victory over the Buffalo Sabres in the Stanley Cup finals. That spring, Joe was recipient of the Conn Smythe Trophy as the playoff MVP. Joe went on to play parts of two more seasons with the Stars before he was traded to the New Jersey Devils. Following his arrival in New Jersey, Nieuwendyk has reached numerous milestones,reaching the 500 goal-plateau, 500 assists and 1,000 points. In 2003, Nieuwendyk earned his third career Stanley Cup ring despite missing the Devils' Final due to injury. Later that summer, he signed as a free agent with the Toronto Maple Leafs where he suited up for one season before opting to move on to the Florida Panthers in the summer of 2005. Nieuwendyk's first season with the Florida Panthers saw the centre tally 56 points in 65 games, however, the club failed to qualify for the playoffs that spring. Due to chronic back problems, Nieuwendyk retired three months into his second season with the Panthers. 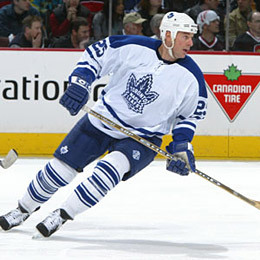 Nieuwendyk played one season for his hometown Toronto Maple Leafs. Joe Nieuwendyk left the NHL as one of the most respected players of his time, collecting 564 goals and 562 assists for 1,126 points through 1,257 regular season games. In playoff action, he added 66 goals and 50 assists for 116 points in 158 games. Besides three Stanley Cup championships, Nieuwendyk won the Calder Trophy in 1988, the King Clancy Trophy (for dedication to his community) in 1995 and the Conn Smythe Trophy in 1999. 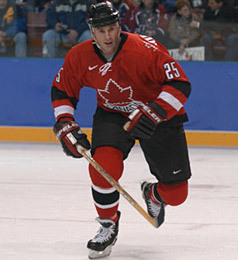 On the international stage, Nieuwendyk represented Canada at the 1986 World Junior Championships, at the 1990 World Championships, and is a two-time member of Canada's Winter Olympic team (1998 and 2002). The accolades continued in 2011. Joe Nieuwendyk was justly rewarded with induction into the Hockey Hall of Fame.